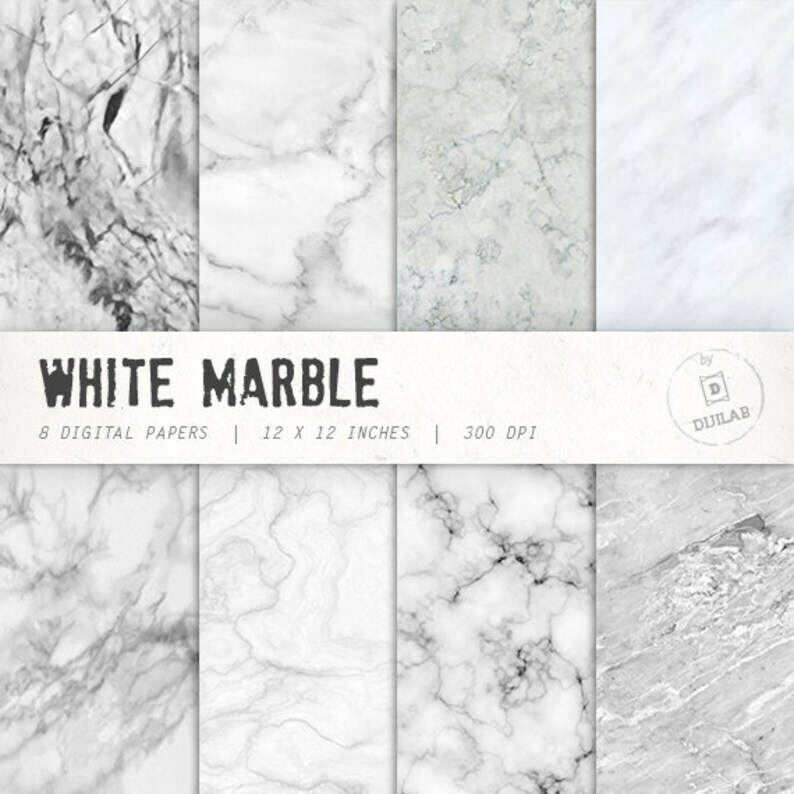 8 white marble digital paper pack with various marble texture. These texture paper will come in handy in any creative project like scrapbooking, model making, invites, card, or origami project and much more project which need a little luxury looks. For personal and small business use only, Pleas see shop policy for more details. Digital files will be sent to your etsy registered email once payment is completed. - Sell or redistribute any product “as is," or as part of a clip art set, digital paper pack, or digital collage sheet. - Claim any artwork as your own. - Use in mass production more than 100 copies. Thanks for stopping by and Enjoy shopping! Very pretty marble options. Love the patterns. Very pretty marble backdrop. Easy and fast download. Great quality! Dijilab encourages buyers to use Paypal to pay for purchases through our Etsy store. In the future the shop may expand it's accepted payment options. If you have any questions on how to use files, please contact me before purchasing. If you have problems opening the files and receive error messages, please contact me. • Printed or digital merchandise for sale (greeting cards, apparel, mugs, etc. ), limited to 100 reproductions per whole Image set, provided that (1) Images are incorporated with other elements into a new design, and (2) original Image files cannot be extracted. • Small business promotional materials (excluding logo designs). • Printed reproductions for unlimited personal use. • Web display for personal or business use as described herein, provided that Images are flattened and scaled to no larger than 800 x 800 pixels at 72 PPI. • Resale or redistribution of original files. • Products in direct competition with dijilab.etsy.com (design resources, stock art, scrapbooking kits, etc.) for sale or distribution, even if modified. • Use as part of a logo or trademark. Please contact me for additional licensing options. Custom orders are not currently being offered. Q: How do I open a ZIP file? A: On most current systems, ZIP files can be opened by right-clicking and selecting Extract, or by double-clicking and dragging the image files to a new folder. Q: How will these files appear when printed? A: Appearance will vary depending on your monitor, printer, and paper type. Note that images have been scaled for web display and may appear differently when printed or viewed at full size. Be sure to set your printer settings to maximum quality for best results, especially when printing any photographic images. Q: Do these files require a specific printer? A: Files are saved in RGB JPG/JPEG or PNG format and are compatible with most printers. If utilizing a third-party printing service, it is recommended to confirm file compatibility before purchasing. Q: Do these files require a specific paper type? A. White glossy paper will yield the clearest results and is recommended for any photographic images. Note that most printers do not print with white ink, therefore image visibility may be reduced on dark or brightly colored paper. Q: Do these files require any specific software? A: Most images can be printed as is. Some alterations (such as adding a background to a transparent PNG file) will require an image-editing program with layering capabilities. Q: Can these files be printed at different sizes? A: Images can be cropped and scaled in your printer or image-editing software. Please refer to your software manual for specific instructions. Note that it is not recommended to enlarge images to more than 125%. If these steps do not resolve your issue, please contact me via Etsy Conversation with the problem stated in detail.